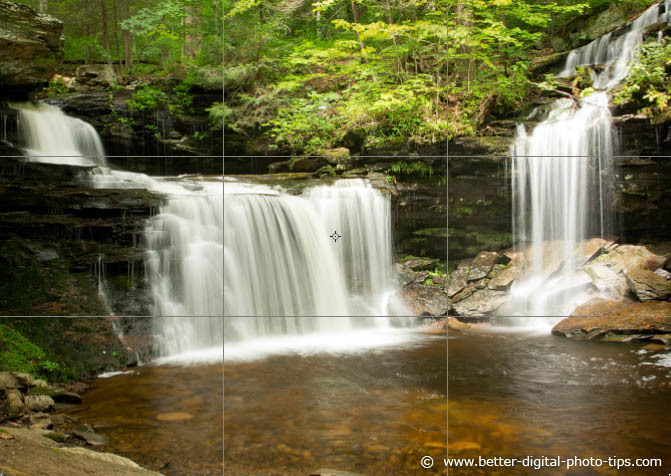 The first photo included in the How to Photograph Waterfalls article used the Rule of Thirds in Photography as a tool for good composition. I used a slow shutter speed and small aperture to get the right exposure and waiting for a cloud to soften the light for pleasing lighting. As with most photography, the how to photograph waterfalls method centers around the three most important elements of photography, exposure, composition, and lighting. Many advanced photographers can call me Captain Obvious on that tip, but it's important to remember the basics before you go for advanced techniques with your photography, no matter what level of photographer you consider yourself. The most common mistake in waterfall photography is over exposure of the water itself. We all like to have that"set it and forget it" type of mentality. The problem is that your auto-exposure camera settings can misread the situation. The dark areas of the scene fool the camera's meter into adding more exposure to you image and the light waterfall gets overexposed. 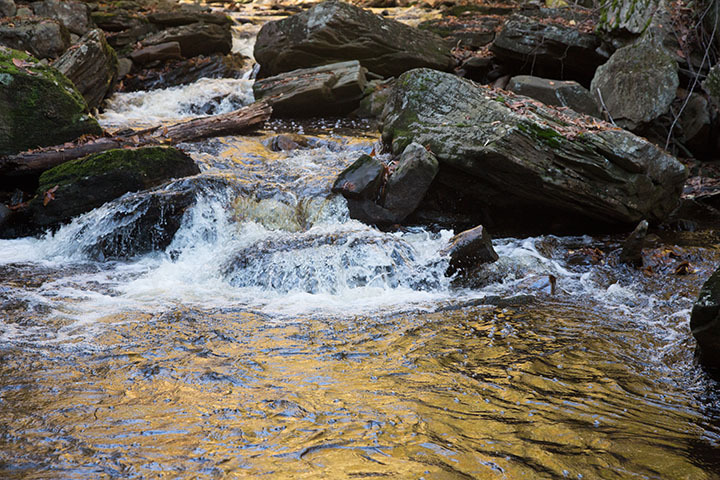 Another challenge occurs when you have direct sunlight striking cascading water. That makes for a very bright situation and it's very difficult for the camera's sensor to capture the contrast correctly. Using exposure compensation or setting the exposure manually are the ways you can correct for your camera's shortcoming. Looking and understanding your camera's histogram is a smart ways to improve your ability to handle waterfall exposure just right. The three factors that affect exposure are ISO, aperture, and shutter speed. How you set each one of them effects how you have to set the others. Together they make up the exposure triangle. Controlling the shutter speed in waterfall photography is the most often talked about subject because of the beautiful results you can get by using long exposures to achieve that smooth, creamy-looking water flow. what's the best SHUTTER SPEED for WATERFALL photography? There are usually two different approaches to shutter speed selection. How fast the water is moving will change the exact speed to use, but generally here are two starting points to use as general guides. To freeze the motion use a minimum 1/200 second or faster for moderately moving water. 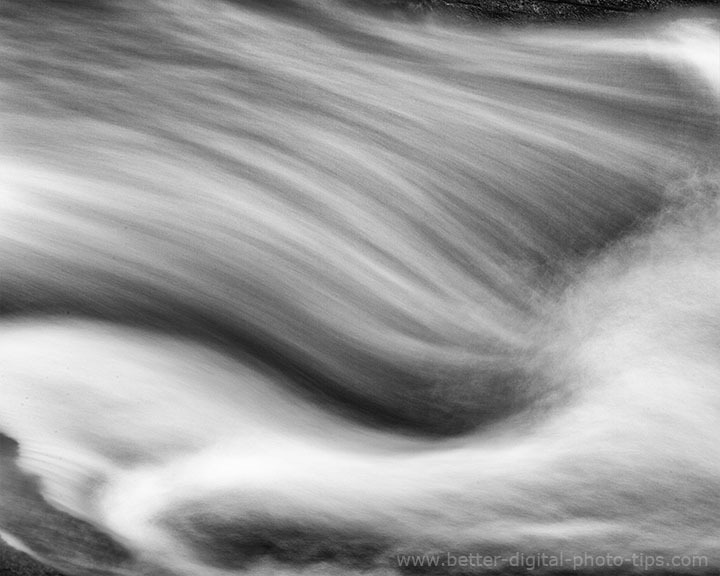 For intentional water movement blur use 1/2 second or slower to get the right effect. Compare the two different motion waterfall photos below and the different effects between 1/200 second shutter speed in the original and 1/2 second shutter speed in the 2nd waterfall photo. Move you cursor on and off of the photo to see a shutter speed comparison of two different effects. The composition itself doesn't really change too much, but look at the splash pool and the waterfall. They're remarkably different. The shutter was open 100x longer at 1/2 seconds rather than 1/200 second. Now look how creamy you can make the water look in the next photo. 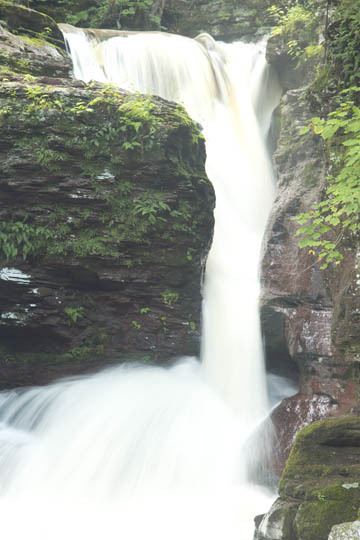 This waterfall photo had a shutter speed of 8 seconds to get this much motion blur in the water. Exposure was 8 second at f/14, ISO 100. If you're only going to photograph a waterfall once during the year, the fall is your best bet for getting some nice color included in your photo. The spring is the best time for getting the most water flow. The best lighting for waterfall photography is often on cloudy days. If your waterfalls is surrounded by trees and other vegetation, that'll cast shadows and produce un-even and contrasty lighting conditions. Good lighting situations also occur early in the morning or late in the day when the sun is low in the sky. If the sky is included in your waterfall composition than blue skies or white fluffy clouds give you the best situation for a nice image. There are always exceptions to every photography rule so its always pays to experiment and learn from the results you get in each situation. That's one of the greatest things about digital photography. Play around. Have fun. Learn from the ones you like and the ones you don't like. A tripod is an absolute must in situation where light is limited or whenever you are using a slow shutter speed to capture the blur of the rushing water. A Shutter cord or remote release. Even when secured on a tripod your camera will move slightly when you push the shutter button with your finger. If you don't want to use a shutter cord or remote trigger, you can always use your camera's self-timer function. A neutral density filter (ND Filter) is a nice add on when you have too much light to use a long shutter speed. ND filters are great for taking very long exposures of waves on the beach in bright sunlight. LCD screen magnifiers like the Hoodman HoodLoupe are great for viewing your camera's LCD screen when you are outside in bright light. They also magnify the screen to get a good look at your focus and sharpness. Try some photos where your camera has an extremely low perspective and include some rocks or plants in the foreground. This creates depth in the photo. If you don't have a shutter cord or remote release you can always use the self-timer. Calm days without wind are better too. With long exposure to get the motion in the water recorded, the breeze will make the plants photograph blurry. Winter is a great time to get interesting patterns of ice and moving water. You must be cautious and properly equipped for dangerously slippery conditions. It's not the normal way to shoot waterfalls, but why not try and get a little creative with your photography. When you get back to your home computer try a few different ways to convert a few of your waterfall photos into black and white. When you're first learning how to shoot waterfalls by using a long exposure, you'll often be surprised by the resulting photo. This black and white was just below one of the falls at Ricketts Glen State Park in Pennsylvania. Have a blast learning how to photograph waterfalls! If you enjoyed this article called how to photograph waterfalls, please share it with a friend. 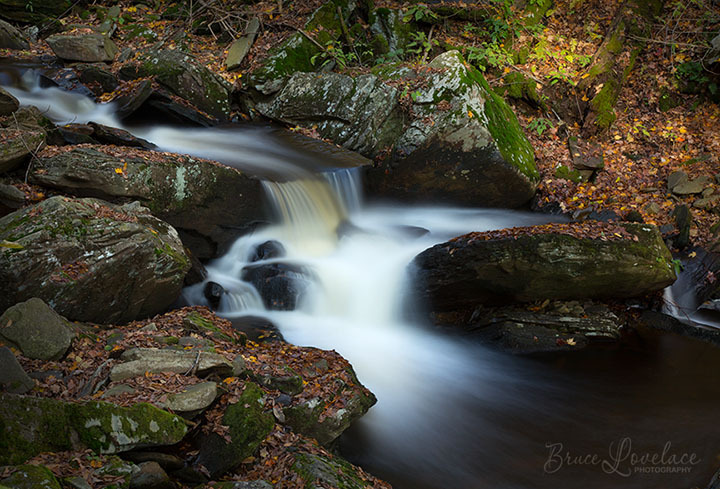 You need more than just a camera with a wide angle lens to get the best results with your waterfall photography. With the exception of hip waders, (I use 12 inch boots) I take all of the following gear with me when shooting waterfalls.